Do you have a passion for food? Do you love cooking? Great news! 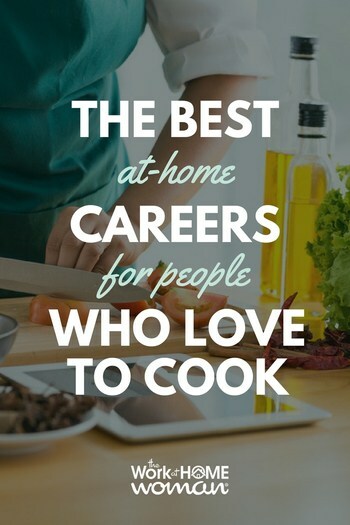 There are a ton of amazing cooking-at-home careers available to you that allow you to put your cooking skills to good use. If you have experience in the culinary industry, or if you consider yourself a foodie, there are plenty of options out there that allow you to earn money while sharing your love of food with others. If you love food and cooking, check out these flexible work-at-home career options. Bon appétit! Teach cooking classes through the Healthy Hands Cooking instructor program. This cooking instructor program walks you through all you need to know to help kids and families create healthy, whole-food-based meals. Over the course of 11 units, program participants learn the basics of teaching others how to cook, food safety, licensing and permits, as well as how to market their cooking instructor business. At the end of the program, you become a certified Healthy Hands Instructor. The course is $9,997 plus an annual fee of $1,000 to maintain your certification. Instructors keep 90 percent of what they earn from their classes and demonstrations. There are many home-based direct-sales business opportunities for food lovers. One of the most popular is Tastefully Simple. This home-based party business has been growing steadily since 1995. Consultants sell delicious, easy-to-make foods such as dips, sauces, seasonings and meal kits in a home party plan set up. New consultants join by purchasing a meal kit for $69.95-$200 and paying a join fee of $39.95. From there, they’re given the tools they need to earn up to 40 percent commission on sales, plus additional bonuses. Another great direct sales option is Traveling Vineyard. If you’re a wine lover, this is an awesome career—enjoy free wine, home shopping parties, and great opportunities. To become a Wine Guide you need to purchase a $189 Success Kit which includes two tasting sets. After you purchase your Success Kit, you receive your own Personal Estate Website (free for the first three months and $15.95 a month thereafter). Wine Guides earn 15-35 percent commission based on monthly sales. They also receive bonuses and a discount on wine purchases! More of a coffee or tea connoisseur? Java Momma sells organic fairtrade coffee, flavored coffee, loose leaf tea, cocoa, and accessories in a variety of yummy flavors like Sea Salt Caramel Mocha and Pumpkin Muffin. Baristas earn 20 percent commission on sales and additional commissions on team sales. Baristas must make one sale or purchase via their replicated website every three months in order to remain active. Java Momma offers two starter kits to choose from, the Cafe Express Kit for $55 or the Caffeinator Kit for $105. 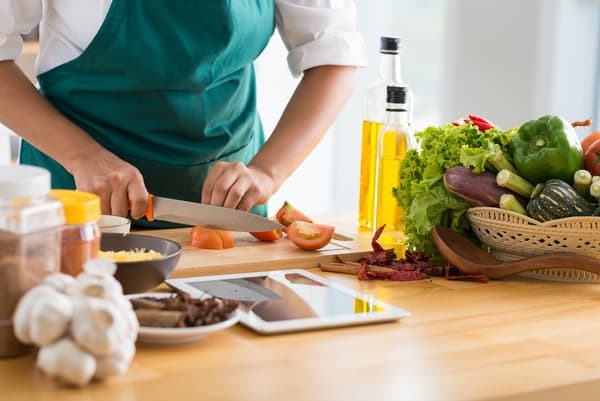 If you’re comfortable in front of the camera and enjoy doing cooking demos, why not create your own cooking classes to sell online? Video tutorials are popular because they help you connect with your audience and people nowadays are all about video. They’re simple to create and you don’t need a big investment up front (besides a laptop, video camera/smartphone, and video platform like Uscreen). Create subscription services for your online videos to keep viewers coming back and to create an ongoing source of revenue. You can even release teaser content on a site like YouTube and encourage viewers to join your subscription site. On-demand cooking sites allow you to share your love of cooking and food experiences with others. Use sites like BonAppetour to take guests around the world, exploring culinary delights and sharing your travel experiences. Users earn up to $1,000 per experience they share with their audience. At EatWith, hosts earn up to $700 per event by opening their kitchen to guests. There are EatWith chefs around the globe, hosting in-home pop-up restaurants and meals for travelers and food-lovers who want a new cultural and social experience. If you enjoy sharing your specialties with others, EatWith offers a unique opportunity to connect with foodies right from your own town. Cookapp offers a similar in-home cooking experience. Open your “in-home restaurant” to share your cooking with friends, tourists, and people in your community. Cookapp chefs are charged a fee (depending on location) once their meal is booked. Cookapp offers professional food photography for your listing as part of their service. Another on-demand site to try out is, Josephine. Cooks keep 90 percent of the total sales from the food they cook and 10 percent is retained by Josephine. If you cook a signature dish or love sharing new recipes and creations with friends and family, this may be a great option for you! Food and recipe writing is an art form. Recipe writers must capture all the steps, ingredients, and details of a dish, so readers are able to replicate the meal successfully. Believe it or not, many cookbook authors employ recipe writers to explain and detail the important steps in recreating dishes. To get started, post your services on Fiverr or Upwork. If you’re experienced with a special way of cooking (Paleo, vegan, gluten-free) or a genre of cooking, writing recipes is an in-demand service. You may also want you to offer photos of their recipe creations as well. In fact, I know of one gal who creates new recipes and shoots videos for bloggers for $300 a pop! In addition to Fiverr, there are other paid writing opportunities where you can craft and list your recipes and even food writing. You may find gigs to write articles for print magazines like Eating Well and Cuisine at Home. Solve a problem, share a food tip or review a favorite meal, food product or restaurant. There are many opportunities for writers with a passion for culinary arts! Passionate food writers can also earn money by creating a food blog. The market for food and recipe blogs is vast and if there’s a niche, food style or area you’re experienced with, your writing is in high demand. Food blogging couple Lindsay and Bjork at Pinch of Yum shared their income reports over the last five years as their blog grew from a part-time hobby to a full-time career. It’s definitely possible to earn a full-time income from food blogging. Photos and attention to detail are key. If you think you are interested in food blogging, it’s easy to get started — check out this post here. If you prefer watching others cook (Food Network fans, here’s looking at you), earn points on Swagbucks simply by watching cooking shows on their video channel. All that’s required? Just log in and watch. You can earn SBs and exchange them for payment via PayPal or for gift cards to your favorite stores like Amazon, Starbucks, and Old Navy. While you won't earn a full-time income from Swagbucks, it’s a nice way to add some extra cash to your wallet. YouTube channel owners earn big incomes! (The top cooking channel, CharlisCraftyKitchen earns $127k per month!) Running your own YouTube channel requires a willingness to share your videos with others, regular posting and a unique creative idea. Vlogging isn’t necessarily the career for everyone but it can yield great incomes for some. One of the keys to working on YouTube is to use your platform to drive traffic to affiliate links rather than relying solely on ad revenue (which requires large numbers of viewers and takes a long time to build). YouTube is also a strong way to drive traffic to your online storefront and sell your own products. Small food makers can apply to sell their wares via Goldbely, a carefully curated food lover’s delivery service. This shop sells the top treats from around the country as they’re created by local artisans, iconic shops, and go-to food joints. Think Joe’s Pizza from New York, Danish Kringle pastry from Wisconsin, or King Cake from Gambino’s in New Orleans. These treats are shipped to buyers around the US so they can enjoy the taste of home or their favorite destination. If cooking is your passion and you love feeding others, find lucrative work as a personal chef. This may mean offering your services for a special event or helping cook, cater, or host someone’s dinner party or get-together. When you’re a personal chef you can set your own prices, work for the number of clients you prefer, and specialize in your own style of cooking. When it comes to becoming a personal chef, word-of-mouth marketing is key. Plus, you’ll want to set up your own website, business cards, and social media accounts. There are many ways to earn money in the food industry while still enjoying the flexibility of setting your own schedule, working your preferred hours, and running your business from home. If you’re looking for stay-at-home career options, don’t give up on your culinary dreams. There are plenty of home-based opportunities for foodies and cooking enthusiasts. Thank you 🙏🤗this what we need for set up own business at home positive and helpful information thank you again. Glad you enjoyed the list of cooking ideas, Shelia! I absolutely love this post and this is exactly what I have been looking for. Thank you! Thanks, Jackie. Updated the price to reflect the correct amount.